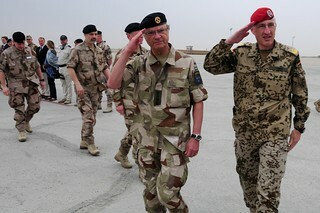 Commander, ISAF Regional Command North, Major General Markus Kneip, greets Swedish King Carl XVI Gustaf during an unannounced visit to Afghanistan on April 14th. King Gustaf met with country’s forces supporting NATO mission and praised the sacrifice his troops are making during the opening of a new military base 130 kilometers west of Mazar-e Sharif. Photo by TSgt. Bea Schoene.